A group of children are recovering after they were struck by lightning in the suburbs. NBC 5's Ash-har Quraishi has the very latest on what happened. Three Illinois students were injured when lightning struck as they waited for a bus in the Round Lake Heights area Thursday morning, according to authorities and school officials. The Greater Round Lake Fire Protection District said the incident happened around 7 a.m. near Lotus and Ottawa Drives in the northern Chicago suburb. Lake Villa District 41 confirmed three of their students were transported to Advocate Condell Medical Center in Libertyville. The district said the students were waiting for a bus when lightning struck nearby. At 10:30 a.m., the district posted on its website that "all three students are alert, communicative and in stable condition." 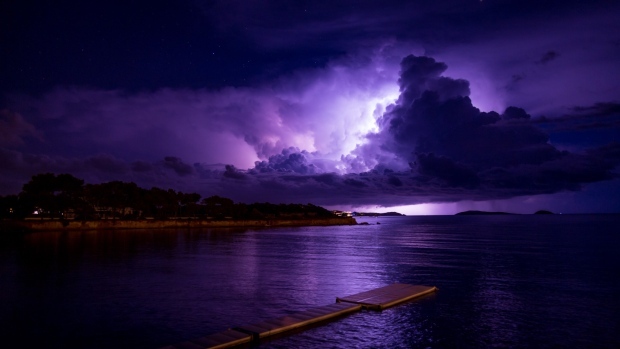 Do you know how to stay safe when a thunderstorm hits? Learn what to do, and what not to do, to protect yourself when lightning strikes. Charlene Monk said her 13-year-old daughter Carrington Monk, an eighth grader at Palombi Middle School, was one of the students injured. Monk said her daughter was doing well with no visible injuries and remained at the hospital for observation. Monk said the teen was standing under a tree with two other girls when lightning struck. She added the girls were unconscious when emergency personnel arrived. Authorities said as many as nine children were at the bus stop at the time of the strike, but some ran home. The fire department initially reported four children were injured. Scattered storms began moving across the area Thursday morning. They were expected to exit over the lake sometime after 8 a.m. Hazards with the storms included lightning, heavy rain and possibly gusty winds. Round Lake Heights is located about 50 miles north of Chicago.